You’ve spent hours learning how to code, building projects for your portfolio, and you finally landed an interview for your dream job. Now there’s another obstacle to overcome: the whiteboard interview. A whiteboard interview is a portion of a tech job interview meant to test your communication and problem solving skills. You’ll be given a code problem or task and a whiteboard, of course, to work out your code and go over your solution. 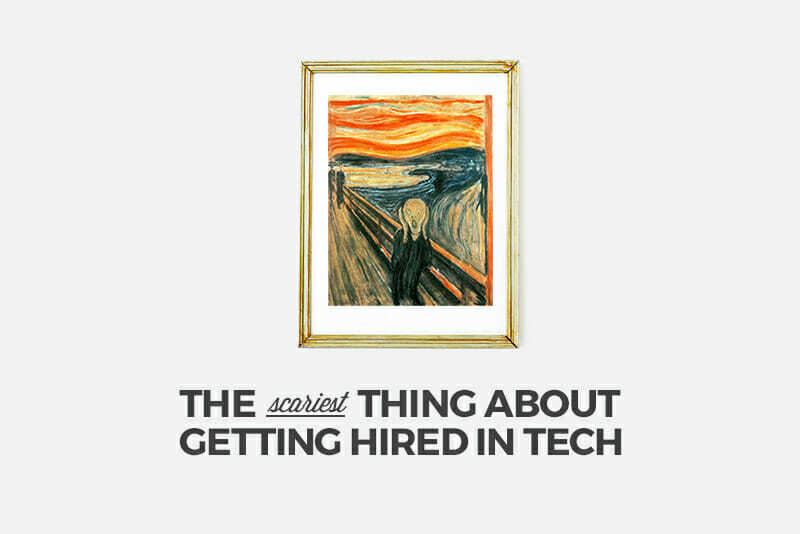 Sure, this may seem a bit intimidating, especially if you’re new to tech—and that’s okay. 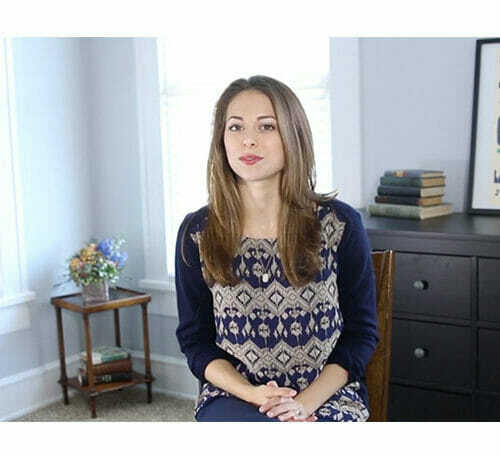 Like any other interview, with the proper preparations and practice, you’ll be able to waltz through it like a pro. 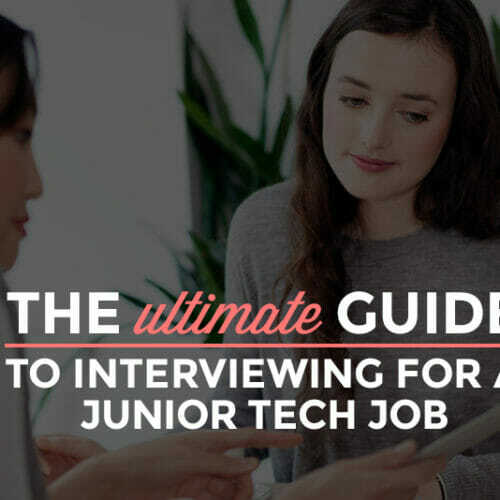 For a comprehensive guide on getting ready for a job interview in tech, download our free ebook, The Ultimate Guide to Interviewing for Your First Tech Job. What exactly are whiteboard interviews? A whiteboard interview is your chance to demonstrate your technical knowledge when presented with a coding problem. Whiteboard interviews are common at many levels, so even if you’re applying for your very first job as a frontend developer, you might need to demonstrate your coding chops live. Typically, interviewers will ask you to work out a solution on the spot by writing your code on a whiteboard while the interviewing team observes and peppers you with questions. The problem may take up to an hour to solve, and the entire interview may last a day. Still, if you’re going to work with these people, then you might as well get to know them, right? What you have to keep in mind is that while it might be called a code or whiteboard test, it is not so much a test of your code as a test of your problem solving abilities. The kinds of problems they give you should feel familiar and doable. In other words, if you believe you are an ideal applicant for the job, then the whiteboard test should be something you can totally handle. Eric Ries, author of “The Lean Startup,” asks candidates to come up with an algorithm for drawing a circle on a pixel grid. 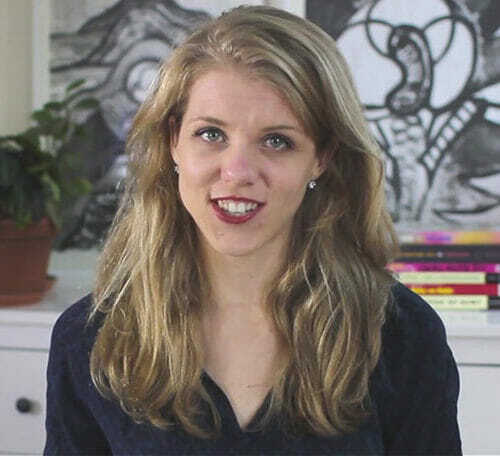 Another example is designing an algorithm to find the longest palindrome in a string, courtesy of software engineer and author Gayle Laakmann McDowell. Why do companies conduct whiteboard interviews? The great question to ask yourself when faced with a whiteboard is: Why am I doing this? What does this exercise show the company that isn’t already on my resume? It turns out it’s less about your ability to get the right answer, and it’s ALL about your problem-solving skills. That’s why people like Ries don’t mind revealing the problem beforehand: Knowing what you have to solve doesn’t necessarily give you an advantage. The whiteboard interview also forces you to code without your preferred tools. Using your own laptop, where you’ve got presets and tools that provide auto-suggest, can give you a crutch. Not to mention using a whiteboard requires less equipment set up for the interview. You’re bound to make mistakes, and that’s expected. The key is how you handle it. When you’re on the job, you’re not going to operate in isolation. Hiring managers want to know how you think on the spot, how you collaborate with colleagues, and how you troubleshoot when you hit a roadblock. If there’s a bug in your code or it doesn’t pass quality-assurance testing, how do you make changes? Don’t worry too much, but interviewers aren’t just looking at what you write on the board. They’ll assess whether you ask for feedback during the process or prefer to keep it all in your head until the end. Your reaction under pressure is also a key part of these interviews, according to tech consultant Scott Hanselman. If you feel challenged, then don’t take it personally. It’s better to respond by showing your thoughtfulness and collaboration skills. In other words, if you’re stuck, ask questions. Or if you’re having trouble making a decision, process it out loud. Don’t worry about revealing a weakness or knowledge gap. It’s better to show the interviewers how you can solve a problem when you’re stuck than to pretend you know everything and fail. Ries wrote that he learns a lot about potential employees by seeing what kind of solutions candidates think are good enough and when they decide they’re finished. This is how they find someone who’s a right “fit” for the company. Now that you understand whiteboard interviews, from what they are, why they are conducted, and have the key resources to practice them, let’s go over exactly how you can prep yourself for a successful interview. Yes, that’s right—go to your nearest office supplies store, buy yourself a whiteboard and some EXPO markers to go with it. Prepare to get your hands dirty, because having a real whiteboard to write on will help you get a grip of what it feels like to scribble out your thoughts. Plus, writing on a whiteboard is much different from pen and paper, so being familiar with the whole process will make it easier over time. Although it’s difficult to predict what questions you will be asked the day of your interview, compiling a list of potential whiteboard questions is essential to helping you practice and gain confidence, as you would do for the non-technical portions of your interview. Make sure to list out different kinds of problems, because your interviewers will want to test your ability to solve on the spot. Variation is key. There’s no better way to get a feel for what the whiteboard interview would be like than having a mock interview with someone who has done it before. If you don’t know someone who is readily available, Codementor has thousands of expert developers who can help you prepare and practice for your interview. You can even schedule a mock interview with experienced technical interviewers and hiring managers to evaluate your strengths and weaknesses so you can properly prepare for the real thing. Everyone learns differently, so watching someone else demo a whiteboard interview is an eye-opening experience as you prepare for yours. Don’t only watch though—be sure to carefully listen and ask questions. If you’re unable to find someone, there are plenty of informative videos and examples to watch so you can better understand what to expect. Whiteboard interviews are not meant to be a silent matter. Interviewers want to know what you are thinking and how you approach challenging questions. Talking out loud may not come naturally to you, but that’s okay. Try articulating your thought process as you complete your daily tasks, like your morning routine, with as much detail as possible. This will help you get used to what you’re expected to do during the whiteboard interview. To take it further, you want to also practice your speaking and presentation skills. Being able to properly communicate your thoughts in a calm and effective manner is key. Don’t forget that the whiteboard interview is, in some ways, a hybrid of a technical test of the depth of your knowledge and also a social exercise. One of the most harmful things to do the night before your big interview is to pull an all-nighter, so be sure to set your alarm (or multiple alarms) and get sufficient rest so you can wake up energized and recharged. 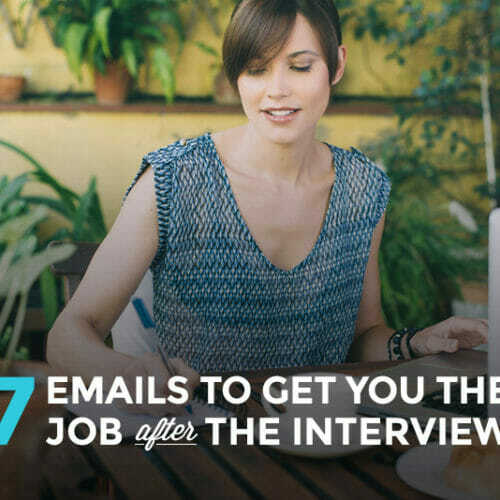 Also, plan to arrive at least 30 minutes to an hour before your interview. This helps ensure that you do not show up late and will give you some time to do a last-minute prep before you begin the interview. Once you are are given a question, take a deep breath and a moment—but not too long—to assess the problem before you begin. If something is not clear or you feel like you need additional information before you can continue, be sure to ask your interviewer for clarification with a few follow-up questions to eliminate any ambiguity. After the details of the task are clear, be sure to talk out loud as you solve the question. The interviewer wants to know what is going on in your head and understand your approach to the task at hand, so being able to explain your thoughts is crucial. For this portion of your interview, often times, you will be judged on your thought process, regardless of whether you’re able to provide a solid answer. Keep in mind that even if you are unable to solve the problem, you want to be able to show that you’ve taken the logical steps to attempt to do so. Sometimes, during your whiteboard interview, it may be difficult to think of an answer when you’re on the spot, but keeping your cool and staying confident in your abilities will always leave a good impression. You’ve put in the time and effort to prepare yourself for your whiteboard interview, so trust your instincts and go with your gut. Even if you feel like you may not have provided the best answer, make sure to stay positive, engage with the interviewers, and persevere to the end of the interview. You won’t be judged only on the whiteboard portion of your interview, so even if you had a small hiccup, don’t worry about it. Keep in mind that being on the right track will always be better than giving up halfway. Think of this portion of your technical interview as a way for the company to evaluate how you would handle difficult situations, so be yourself and trust me, you’ll get through it! 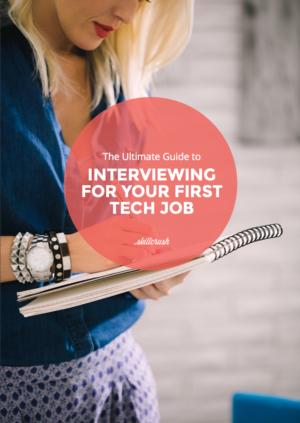 For more advice on technical interviews and step-by-step checklist for preparing for the big day, get our free ebook, The Ultimate Guide to Interviewing for Your First Tech Job. 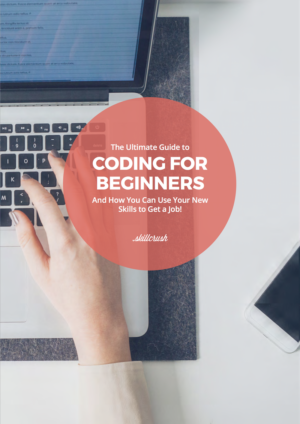 Debbie Chew loves writing about topics that help those who want to become a web developer or just learn to code. She’s also Head of Operations at Codementor.io, a platform for live 1-on-1 help with coding. During her free time, she enjoys watching Korean dramas and walking her dog.